All interactions through the website/email were professional and made me feel confident in my choice of CVR. Everything about the Eagle's nest was fantastic. The proximity to Lutsen while being away from everything was great, the house itself is gorgeous and included everything we could have desired and more. Definitely would recommend! Great location on the north shore with easy access to parks up and down the shore - also loved being right on the water! We stayed here in the winter so it was wonderful to have a real fire at night. As an end unit we found it to be very quiet and relaxing. The deck would be a wonderful place to sit in the summer! Staff was very friendly and called to be sure that I had the instructions to get into the property. Very nice house with great views of lake Superior. Staff we encountered were professional and courteous. Working with the online reservation people was good and the check-in and check-out procedures were easy to follow. Cabin was exactly as advertised. Very comfortable, cozy, nice layout. Kitchen was fully equipped (coffee maker, microwave, toaster, dishwasher, full complement of dishes, cutlery, pots and pans, other cooking and baking tools. In-floor radiant heating was outstanding. The lighting is a bit dim (low-watt LEDs) but plentiful and a few fixtures are dimmable. IF you want to have bright light for a detail-oriented project, consider bringing a small table or desk lamp with you. Once we got used to the lower light levels, we found it warm and romantic, but we don't have super-bright lights in our own house, so it wasn't a problem for us. TV watchers may be disappointed with the limited number of stations available but the DVD player worked well for movies and the TV screen in living room was of modest size but had a good picture. Didn't try the bedroom TV. "Two-person jetted tub" was a tight fit for two "normal-sized" people. Not long enough for a six-footer to stretch out. The triangular shape allowed a bit of extra room but not enough to fit two comfortably. However, the water was hot and plentiful and the jets were numerous and provided good whirlpool action. Condition of the cabin was good. Everything seemed clean and in working order. Thermostat was locked and inaccessible, which was a minor inconvenience because we like the indoor temperature cooler than the 73 degrees it was set at. We asked a staff member if they could unlock it so we could turn it down. He found some keys but struggled to remove the cover. He managed to pop it off and we were able to lower the heat for our stay. I understand the owners not wanting renters to waste heat by cranking the temp up too high, but some provision should be made to give renters at least a little flexibility in the cabin's temperature setting. Service was good. Shovelers, snowblowers, and plow crews were at work soon after the two snowfalls we experienced. Firewood supply was replenished while we were there. Fireplace worked very well. View of lake is only a partial but still a nice view. Waves can be heard from the deck and the cabin is on the edge of a small wooded ravine which provides some privacy and quiet to the east. Location is great, only a few miles from Gooseberry and about 10 miles from Two Harbors. Tahoe View 124B. Nice place with a nice deck and view. Great location. Nice view of trees and lake in the distance. Where do I begin? Rather than type any more than I already have, let's just sum up my experiences over the years with all members of the CVR team by saying this: Everyone has always been welcoming, friendly, caring, helpful and willing to listen. You can't ask for more than that in my humble opinion. Blue House is very easy to find and is a very short walk to all that the Lutsen Mountain ski area has to offer. Very spacious home. New King bed in their Mountainside Bedroom is one of the most comfortable beds I've ever slept in! Large Game Room is fun to hang out in with "in floor" heating to keep the feet warm if the ping pong and/or foosball playing doesn't get the heart pumping enough to do so. 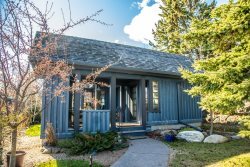 Very open and large kitchen, dining & living room areas make this perfect for cooking, dining & relaxing with family members after a day on the mountain. Fireplaces will warm you up in both the Living Room and Game Room. Keep in mind though, this will also be a great place to rent even after the snow is gone. There is a ginormous deck and a gazebo that provides GREAT views of that wonderful lake we all love. The team at CVR has been great to work with on all of our rentals. We'll be back! My wife Lisa and I had stayed at Morning Light in August 2016. We had a delightful stay then and decided to check it out in the winter time. President's Day weekend was awesome - we went cross country skiing twice, visited Grand Marais on Saturday and spent the day Sunday watching is snow. We picked up over 12"! This structure was the most beautiful work of art that I have ever seen or had the pleasure of staying in for a long weekend. If I won the lottery I would beg the owners to sell the home to me no matter the cost! Great Little House We think they should have used pocket doors on the bedroom & bathroom to get more room. there were no trash cans to put our trash so we took it with us. Great Kitchen!! We always enjoy coming to relax at Chateau for a winter getaway, this was our 4th time staying there. Just great! They called me to remind me to sign my rental agreement (which I had over looked in an email), and Dennis the caretaker was so pleasant and helpful. Loved it!! The room was fully stocked and Dennis was very helpful and nice! Thank you, we had a great family/guys weekend. The house is beautiful. Beds were newer and very comfortable. Perfect size and great views. In good proximity to Lutsen mtns and a Holiday or General store. Had all of the cooking items we needed. Bummer about no wood for fires though. This is our second cabin (third trip) weve rented from Cascade Vacation Rentals and all trips have met and exceeded our standards. The cabin was amazing!! Nice and quiet, great location and central to lots of winter hiking. Appreciated the well stocked kitchen for appliances, extra pillows, firewood, etc. We loved the cozy Northern Lights cabin as did our dog Emma. Great location! We would definitely stay here again! Fast responses, very polite. Thank you! We LOVED the condo, it was perfect. There is a nice little caf and grocery store just south of the condo. We had very little interaction this time. I booked online and met one person for about 2 mins when I picked up the keys. I have had more interaction with the team in the past and have always been treated well and professionally. Beautiful location and house design. Perfect for 3 couples. We each had at least a full size bed and our own bathrooms. In the past, we've had to make do with twin beds or bunk beds in at least one room. House was very clean, easy to find and a good location. Also very quiet. I spoke with and e-chatted several times with Elizabeth. She was very helpful! Our group was very pleased with our lodging here at 6526 Aspenwood Drive. The people at Cascade Rentals are always a delight to work with and are very professional. Thank you! We've been here a few times and love it! Unfortunately the dishwasher wasn't working and it was the weekend so didn't call management. Being an older couple we appreciate the comfy beds and furniture. It was very cold so we were unable to enjoy the out of doors as much as we usually do. However, we made use of the television and made it into a fun movie weekend. The lake was gorgeous! Jaye has been very helpful with setting up our trip and answering questions about the property. Great little place! Excellent views of woods from huge windows. We saw several deer in just a two night stay. Neat and clean. Lots of amenities. Convenient to Tofte and lot of north shore activities.